Wave after wave crashes onto the huge granite blocks at the base of the seawall. Sand and water trickle in and out of the crevices. Endless possibilities. Boat? Beach? Moody Pyramids? Schlitterbahn Water Park? The Historic Pleasure Pier? Or maybe all of them? A dreamy day. As the sun warms my Hawaiian shirt, I realize that whatever I do, I want a group of laughing friends to make it fun. I text a few friends I know and we’re on for the day. Instead of deep-sea fishing run, we’ll head to Jimmy’s on the Pier. With some fishing rods in the back of a truck and some bait, we’ll enjoy a few hours hanging out by our friend, the brown pelican. Toss in the lines and pluck out the fish. Easy. Jimmy’s even has a rescue setup in case someone snags a sea turtle. A great way to care for an endangered species. Jimmy’s has lots of good “eats.” I enjoy the clam chowder, but all the seafood is terrific! After finishing a tasty treat, the biggest problem on my plate is what to do next. I glance at one of my pals. 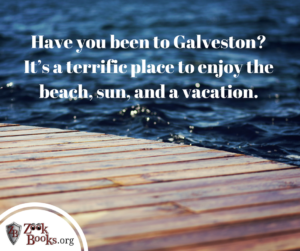 He recommends surfing by the Pleasure Pier. He’s prepositioned the boards there, in case I was too chicken to try it. I nod. Should be loads of fun. A knot of surfers has gathered close to the best wave-producing part of the pier area. Chest on my board, sun on my back, and my buddies racing ahead, I can’t wait to ride a few waves. I love the feel of my muscles cranking with powerful strokes as I race to the waiting place. Patience is key. Several swells go by. Then a powerful wave builds, twice the height of the others. Wait… wait… now. I paddle like a crazy man, working to catch the wave. I push to a crouch, then I’m on my feet, riding the wave. The wave dies and I drop into the water, letting it wash over me. I pull my board back to me and go for another ride. After an hour or so, it’s time for another adventure. The wind has kicked up a bit, so the gang decides on the Harbor Tour near Pier 21 across the island. After we board the vessel, in minutes a pod of three dolphins jump out of the water like a show, playing in the harbor. Our group, now ten guys and gals, have one mission – have tons of fun. On the boat, not only do we get to feel the breeze whipping past us when the ship really starts flying along, but we see an old wreck in the distance that we circle for a while. Dinner’s next. We love the beach and a view. Our choice is Fish Tails, right across from the Historic Pleasure Pier, our final destination of the day. Fish Tails has great seating where you can enjoy the sea views from the first and second floor dining areas. I always choose the topside. I lead the gang up the winding stairs to the second floor and window seats. A mockingbird tries to steal a piece of shrimp, but I shoo him away to join the other birds waiting for a tender morsel. At last, we join the crowds that surge onto the Pleasure Pier. The lights glow and the arcade bells and buzzers create the familiar amusement park’s backdrop. The Texas Star Flyer wheels us over the surf, the Ironshark Rollercoaster does an incredible incline drop, and the Pirate’s Plunge splashes water over everybody. Rides, games on the Midway, and snack foods galore fill me up until I’m ready to head back to the hotel. Thoughts of a day of excitement fill my mind as I drift off into the deep sea of slumber, resting for the next day’s adventures.